M ore than 200 attendees came to the DoubleTree Hotel in Cathedral City to listen and watch Mayor Stan Henry present the “State of the City” hosted by the Greater Coachella Valley Chamber of Commerce. A common theme from the guests who made up the roundtable discussions was how business-friendly Cathedral City was in opening their business. It was echoed from small business owners, developers, and large corporations. 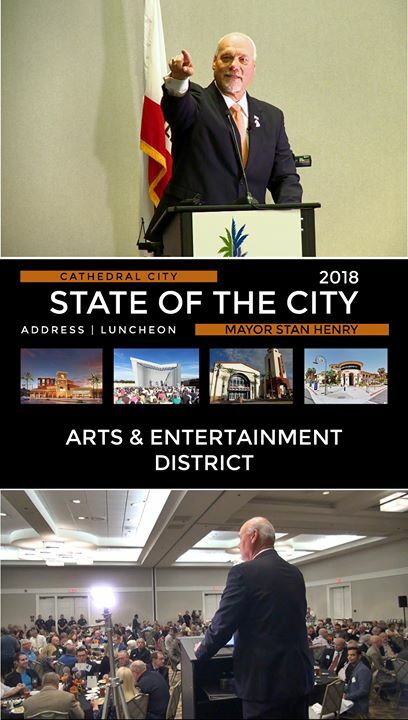 In three years, the council has helped to create four anchors to turn Downtown Cathedral City into an Arts and Entertainment District. 1. The renovation of the Mary Pickford Theatre. The theater went through a complete renovation externally and internally with new captain chairs, new bathrooms, carpeting, and now, with new solar panels being installed, it will be the first motion picture theater in the country to be 100% sustainable. 2. The City applied for and received a $1.4 million dollar federal grant and matching funds from the City Urban Revitalization Corporation (C.U.R.C.) to build a $2.8 million amphitheater park next to the City’s parking structure. Construction of the park will begin in May. Along with the Festival Lawn, the new park will be used for festivals, concerts, art shows, food truck events, Shakespeare in the Park, and much more. 3. CVRep has taken ownership of the former Desert Cinemas building and has already started renovations to turn it into a LIVE performing arts theater. CVRep is the only playhouse in the Valley to possess a Small Professional Theater status with Actor’s Equity. 4. Agua Caliente Band of Cahuilla Indians are six months into a 24-month process of turning 13 acres of fee land at the corner of East Palm Canyon Drive and Date Palm Drive into tribal trust land. Tom Davis stated that they are currently moving forward with developing plans for the new casino, restaurants, and mixed-use commercial spaces. Once the land is in tribal trust, construction will begin shortly thereafter. In addition, thanks to the Tribe and C.U.R.C., a new fire station will be built to serve downtown and the south side of Cathedral City. 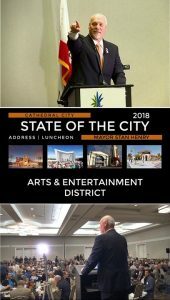 The Council has approved more than $100 million of investments for infrastructure through Cathedral City including new street resurfacing or reconstruction, three major bridge refurbishing or building (Date Palm Bridge, new Cathedral Canyon Bridge, and Ramon Road Bridge), the CV Link segments, new sidewalks, new way finding signs, and new parks. This is extremely important as government must invest in its public infrastructure to lure private developers. 1. Over the past several years with improved finances and federal grants, the City has hired 9 new firefighter–paramedics allocating for the first time in a long time, three firefighters on every fire unit. This allows each fire unit to immediately begin to extinguish a burning structure upon arrival. Previously, the fire unit of two firefighters would have to wait until another unit arrived on the scene. 2. Construction will begin later this year on a new Downtown fire station near the corner of Buddy Rogers Avenue and Date Palm Drive. 8. Engaged in community activities to connect with residents and business owners. Results include a 27% drop in Part 1 Crimes from 2016 to 2017 and a less than 7-minute response time to all priority calls. The City hired an additional code compliance officer to allow for weekend enforcement. A service not previously available. This helps with monitoring illegal garage sales, responding to noise complaints from residential neighborhoods, enforcing park use permits, as well as all conducting other normal code compliance matters. The City has worked over the past several years to turn the tide on vacant commercial spaces with new restaurants, retailers, and the new Regency Theater. Highlights included the new Ace Hardware and Planet Fitness. Additionally, the City has been able to get several new businesses to agree to a Local Hire First Program where they attempt to recruit Cathedral City residents for employment first before seeking employees outside of the City. This new 9-acre, freeway-oriented development is currently under construction at the southeast corner of Bob Hope Drive and Varner Road. It will be the first new project in the recently annexed area of Cathedral City. Major improvements include a 98-room Best Western Plus hotel, a McDonald’s, Starbucks, Taco Bell, and an Arco AM PM Fueling Center. 1. Honda of the Desert finished it new façade for its sales and service center. 2. Shottenkirk Desert Lexus will build a new sales and service center next to Volkswagen on East Palm Canyon Drive. 3. Subaru expanded its footprint while Volvo moved to the newly renovated facility in the former Flooring Innovations space. 4. Mazda at Palm Springs Motors in Cathedral City will soon remodel its sales and service center following its neighbors, Ford and Lincoln. 5. College of the Desert is in its final stage of locating a suitable site for moving its Automotive Technology Center from its main campus in Palm Desert to Cathedral City. 1. The City was pleased to announce that Riverside University Health Systems will build a new comprehensive Family Care Clinic in Cathedral City. It will offer physical health care, behavioral health, OBGYN, pediatrics, dental care, physical therapy, and a workforce development center. 2. The first segment of the CV Link opened to much fanfare for the first 2.4 miles. The environmental pathway shall be used by runners, walkers, bicyclists, and neighborhood electric vehicles. Additional segments will be built linking the first segment to Downtown Cathedral City allowing a new path for future gaming, dining, and enjoying festivals and the arts. 1. The Sunniva facility on Ramon Road is under construction and the first phase (325,000 square feet) will be fully leased out by November. 2. Atomic Budz, a cannabis retailer, stated that their January sales (the first month allowing recreational use sales) were 300% higher than December sales. 3. The first cannabis manufacturing facility will open soon on Summit Drive in the City’s light industrial zone with additional sites opening later this year. 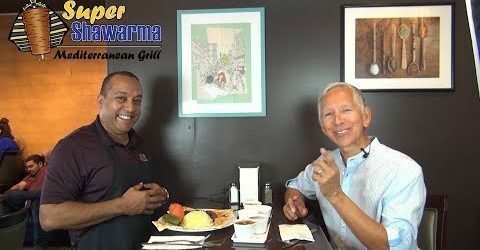 38 New Restaurants in Cathedral City Since 2015! Change Is Happening! Check out this video to learn more about the emerging cannabis industry in Cathedral City. Mayor Henry talks about the laws pertaining to use, the numbers of facilities, the revenue currently being generated and future growth projections. He also highlights the current cultivation center being built on Ramon Road. The Cathedral City Economic Development Department, the City Council, and Owners Richard and Eric Altman invite you to join them in a groundbreaking ceremony for the new “Runway Dining, Drinks, & Drag” (Runway) restaurant that is being built in front of the CCBC Resort Hotel located at 68-300 Gay Resort Drive in Cathedral City. 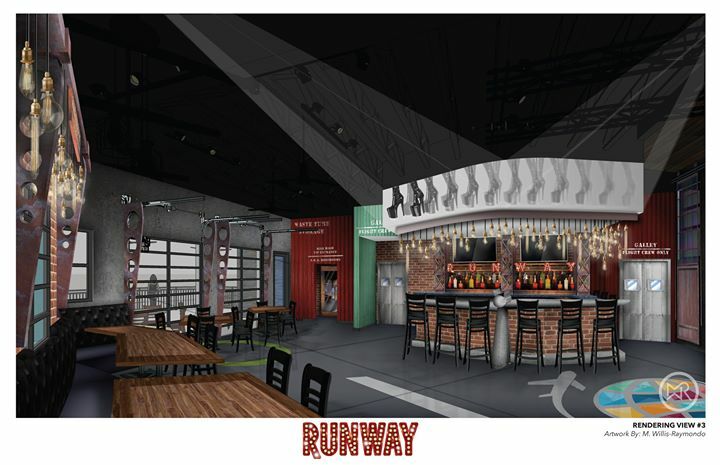 Plans include a well-appointed 2,560 square-foot restaurant with a 568 square-foot outdoor patio dining area. The Runway will offer American Grill cuisine and LIVE, local entertainment featuring a retractable stage. The 24 hours / 7 days a week restaurant is the first restaurant to be built in Downtown Cathedral City from the ground up in nearly a decade. A groundbreaking ceremony will occur on Monday, March 5, 2018 at 5:00 pm in front of the CCBC Resort Hotel located 68-300 Gay Resort Drive in Cathedral City. Owners Richard and Eric Altman will host a small celebratory reception following the groundbreaking. The event is free and open to the public. 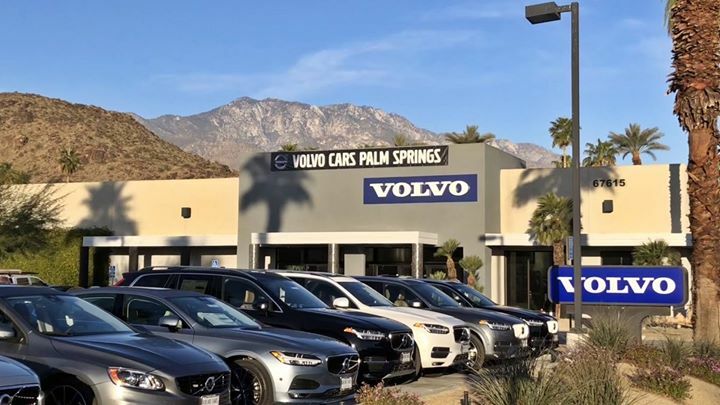 Cathedral City’s Auto Center continues to expand as the former Volvo/Subaru Dealership has split into their own stand-alone dealerships. 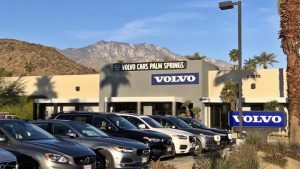 The Volvo Dealership, now owned by Dan Jessup, has moved to a brand-new location at 67615 East Palm Canyon Drive in Cathedral City, the former Flooring Innovations building. According to Mr. Jessup, the dealership is currently under a soft opening with a Grand Opening Celebration to occur late March or early April. The Subaru Dealership, owned by Wes Hinkle, will expand its footprint by taking over the entire dealership location at 67925 East Palm Canyon Drive in Cathedral City. 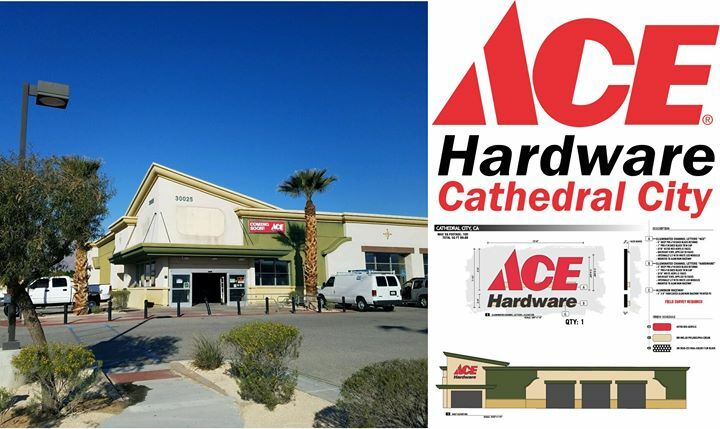 Cathedral City’s Economic Development Department is excited to announce that ACE Hardware Cathedral City will open in April at the former Fresh and Easy Grocery Store located at 30025 Date Palm Drive. Ace stores offer a wide variety of paint, lawn and garden, tools, business supplies, local niche services and virtually anything you’ll ever need to fix, repair and maintain your home or business. And of course, Ace is most certainly the place with the helpful hardware folks! Owner Michael Reinhardt looks forward to opening the 14,000 square foot store quickly to provide residents with a local hometown option for all their home improvement needs. This will be one of ACE Hardware’s largest stores. Community is what ACE Hardware is all about and they have already sponsored the Easter Kidapalooza on April 1, 2018 in Downtown Cathedral City where 25,000 Easter Eggs will be given away! 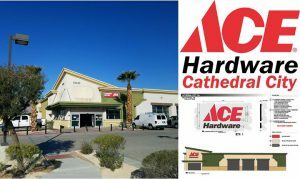 It takes local businesses like ACE Hardware to help fund our community events. 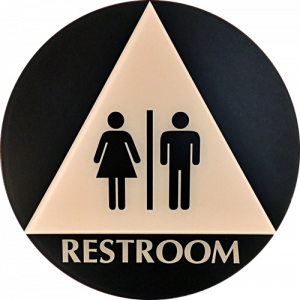 The City Council adopted a Gender Neutral Restroom Ordinance effective January 2016 to address the needs of all people, regardless of the way one presents or identifies their gender identify. 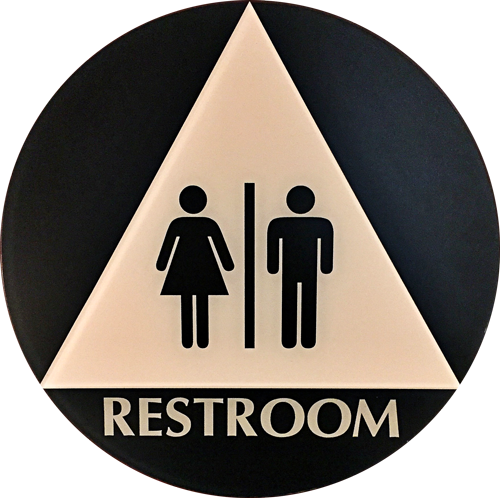 To comply, a single user restroom(s) within a commercial facility must have gender neutral signage (defined as a sign that indicates a restroom without reference to a specific gender) installed. The complete ordinance, Cathedral City Municipal Code Chapter 5.86, can be accessed at Municipal Code Link. For additional information, contact Al Jimenez, City Building Official, at (760) 770-0358. A proliferation of abandoned shopping carts creates a visual blight in the city and causes a number of other issues. It reduces property values, interferes with pedestrian and vehicular traffic, impedes emergency services and is generally a public nuisance. 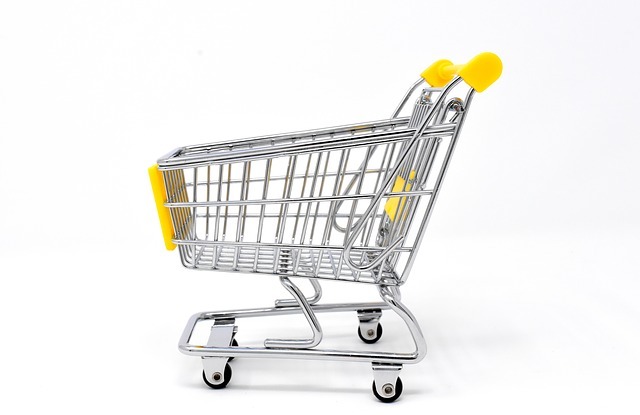 In 2016, the City Council adopted regulations to ensure that owners and operators of retail businesses who provide shopping carts take reasonable measures to provide prompt retrieval of abandoned carts. The City’s Shopping Cart Retrieval Program is based on input received from the community. Conversely, to assist business owners in reducing the number of lost shopping carts, the ordinance follows the provisions of state law by stipulating that removal of a cart without permission of a business constitutes a criminal misdemeanor. A summary of the ordinance can be accessed at PDF Document Link. The complete ordinance, Cathedral City Municipal Code Chapter 13.160, can be accessed at Municipal Code Link. For additional information, contact Patrick Milos, Community Development Director, at (760) 770-0319. In the fall of 2017, the City Council voted to promote healthy meal options for families and contribute to building a healthier community. 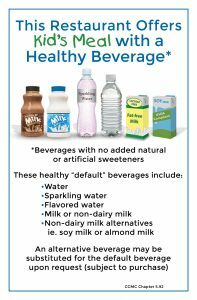 They did this by adopting an ordinance requiring healthy beverages, such as milk and water, be the default beverage for children’s meals offered by restaurants. Sugary drinks, including soda, energy and sports drinks, sweetened water and fruit drinks, provide the largest source of daily calories in the diets of American children ages 2 to 18. Each extra serving of a sugar-sweetened beverage consumed a day increases a child’s chance of becoming obese by 60 percent. Water, sparkling water, or flavored water, with no added natural or artificial sweeteners. Milk or non-dairy milk alternatives, such as soy milk or almond milk. A restaurant is not prohibited from selling, or a customer from purchasing, a substitute or alternative beverage instead of the default beverage offered with the children’s meal if requested by the purchaser of the children’s meal. The complete ordinance, Cathedral City Municipal Code Section 5.92, can be accessed at Municipal Code Link. For additional information, contact Leisa Lukes, Business Development Manager, at (760) 770-0386 or e-mail at llukes@cathedralcity.gov.